Scooby Doo reimagined as The Blyton Summer Detective Club, but grittier. Scooby Doo meets H.P. Lovecraft? Who wouldn't want to dig in with a book being marketed this way? Certainly not me since that seemed quite the, um, interesting pairing. Teen detectives (The Blyton Summer Detective Club) are well known for solving a particular case, and their last one at that, in Sleepy Lake. Somehow, something resonates horrifically with each of them - the invariadubitably (hey, if the author can make up words, so can I - it's fun to say - try it!) large pink elephant in the room! Thirteen unlucky years later, they reunite to go back and face this metaphorical elephant head on. I am so torn with this novel. I want to love it. I really do. But I just... don't. What I liked about it: various ha ha moments with nods such as "Nancy Hardy, journalist", Arkham Asylum and Zoinx River. Cute, very cute. And going in with Scooby Doo being the main factor, it was easy to see how this was more humor and nostalgia than anything else. For that, I can appreciate it. However, what didn't work for me was the writing style. I felt it was all over the place. Set stage one, scene one... and then back to novel style... then screenplay... sometimes dispersed sporadically throughout a section written like a (dare I say) "normal" book. I also learned more about the proper way to destroy a man's testicles than I ever needed to, though I found myself smiling during this part and I'm not sure what that says about me as a person or if I'm just in a mood... *wink*. And that was just in the first 50 pages. Ultimately the story line was fine - I can totally appreciate what the author was trying to do and found my love (again) for the Scooby Gang, er... BSDC, that is. I think the writing style hurt my brain a bit though. I'm off to find the Mystery Machine and Shaggy for some Scooby Snacks. 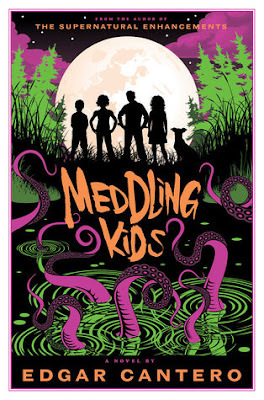 The second I saw this cover and heard, "Lovecraft meets Scooby-Doo" I was instantly intrigued. 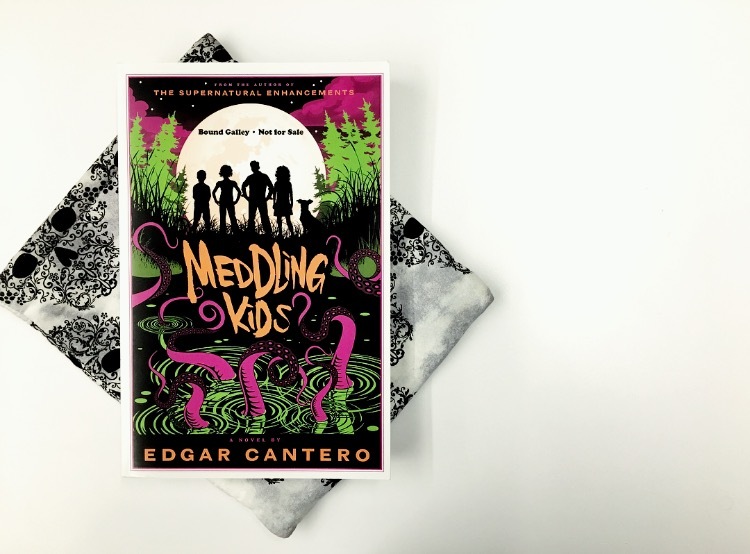 MEDDLING KIDS by Edgar Cantero was nothing less than that! 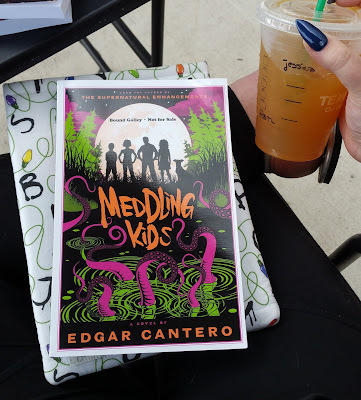 It was horror and humor mixed together and I definitely enjoyed the read. I can already say that this won't be for everyone - some of the words/language used and the mix of styles made it an awkward read at times, but I still enjoyed the unique reading experience. We go back and forth between present day, 1990, and the past, 1977. The Blyton Summer Detective Club - a group of teen detectives and their dog - haven't seen each other since their last, failed, case back in 1977. Our characters are Andy, Kerri and Tim (the Weimaraner), Nate, and Peter. Andy, the tomboy, is now on the run and she is wanted in two states, Kerri, the kid genius and blossoming biologist, is now a bartender with a serious drinking problem. Time, the Weimaraner, isn't the original dog side kick of the group, but he is the descendant! Then we have Nate, the lover of all things horror, has been in and out of mental institutions for the last 13 years. The only friend he still sees is Peter, the jock turned movie star, but there's only one problem, Peter's been dead for years. The time has come where they must go back to Blyton Hills, their small mining town in the Zoinx River Valley (Oregon), to uncover their final mystery from 1977, the Sleepy Lake Monster Case. This was the case that ruined them and resulted in the wrong man going to prison for the crimes. Cantero has a very interesting writing style. Something that keeps you on your toes - changing from narrative to a more screenplay-type style. I can see this putting some people off. He also adds in some over the top words that aren't words. It was definitely an interesting read from start to finish. I enjoyed the mystery and will definitely say that it is more on the humorous side than the scary side. Still lots of spooky and eeriness to it though! Just what you'd expect from Scooby-Doo and the Gang. The characters are well developed and likable, they definitely came into their own and weren't the clear images of Fred, Daphne, Velma, and Shaggy. If you want a mystery horror story with a lot of comedic relief, then this is the book for you. If you're looking for something terrifying, this probably wouldn't be my first recommendation. Now, excuse me while I go watch some Scooby-Doo! Wow. 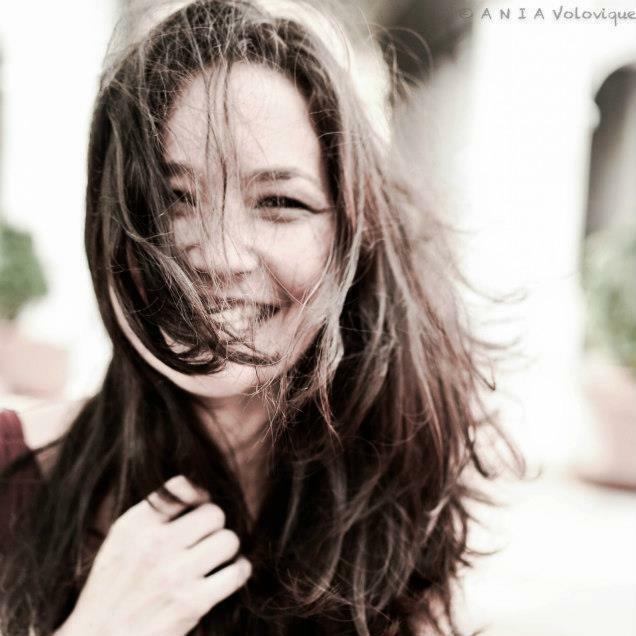 I must appreciate your creation that is inspiring and attractive as well. I hope that things may go in a perfect way if we present these type of cards to our loved one.